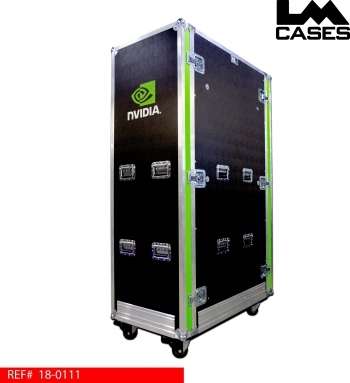 This case was designed for Nvidia to be a portable server rack for use at trade shows. 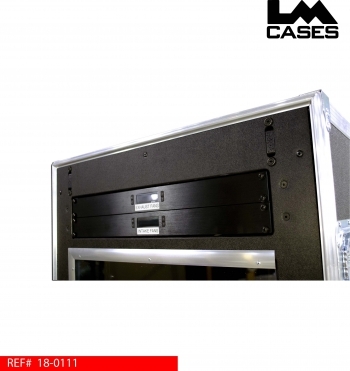 The case holds 32RU of gear in a shock isolated inner shell to prevent damage to the delicate servers. 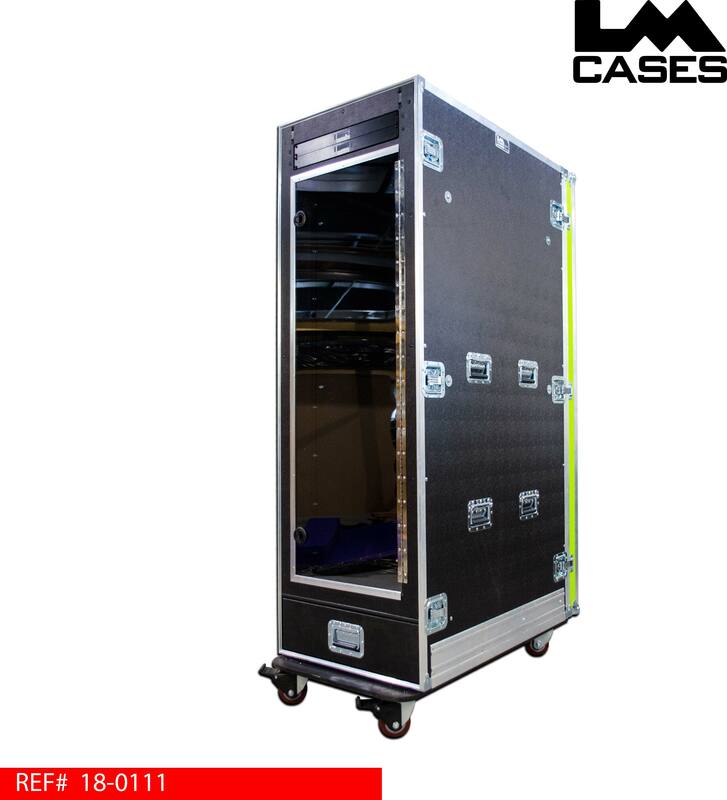 To dampen the noise of the server fans, the inner shell features 10 ultra low noise cooling fans and 3/8” thick clear Lexan doors at the front and back of the shell. 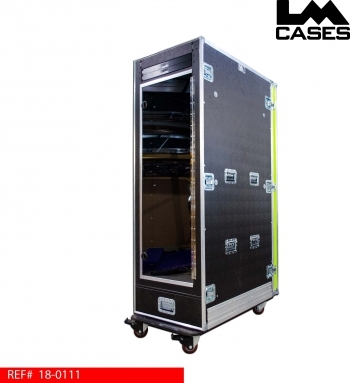 The inner rack shell is built out of 1/2” plywood, and features front and rear box style server rack rail. 10 ultra low noise fans are installed to provide ventilation for the equipment. The fans are separated into 2 banks: intake and exhaust. 4 intake fans are mounted in the bottom of the server rack shell, and connected to ducts that pull air into the case from the bottom. The ducts create 4 individual sealed cold air intake channels, each duct is protected with expanded metal over each intake port. 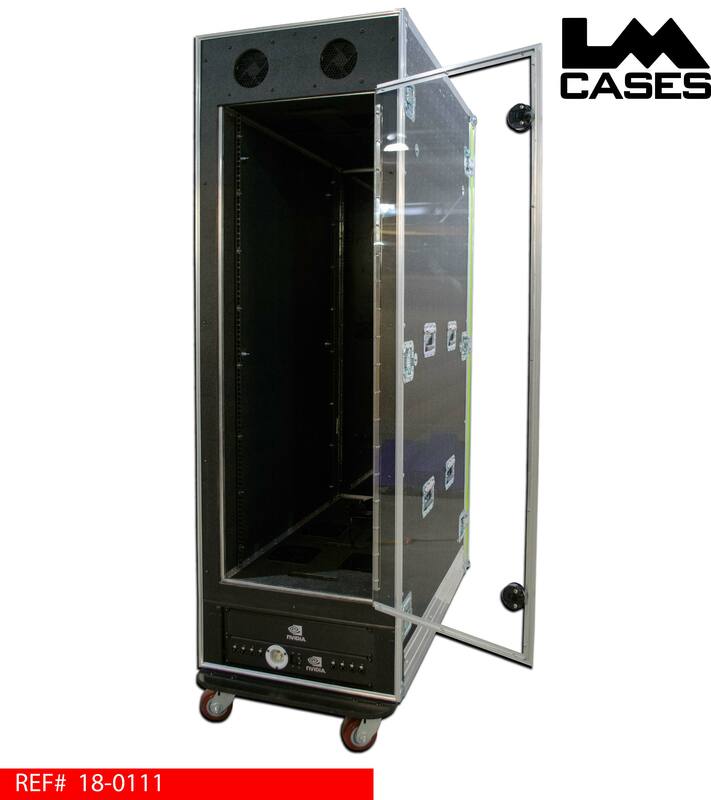 The exhaust fans are mounted in the top of the rack shell which pull hot air up into a top cavity, 2 rear mounted fans exhaust air from the top cavity. The top mounted cavity forces a 90 degree angle for the air flow which causes a natural dB reduction. Each fan bank (intake & exhaust) are powered and monitored by 2 separate controllers. The controllers feature thermostats with temperature probes which monitor heat at critical points and sound an alarm if the temperature limit threshold is exceeded. Mounted below the rack shell is a storage drawer. This drawer is built out of 1/2” baltic birch, finished with black texture coating and mounted on HD Accuride glides. Behind the drawer is a 4RU rack section which features a blank 2RU panel with the Nvidia logo etched on it, and a custom power inlet panel. 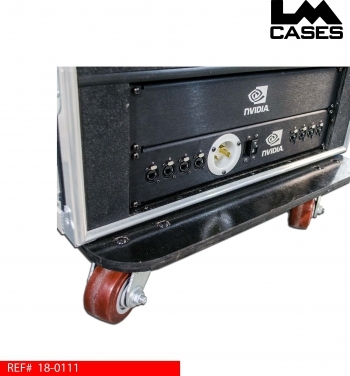 The rack uses 208v power, which is brought into the case via a custom inlet panel. The panel features a L6-30 inlet with a hydraulic 30 amp breaker wired in line, this panel will act as an interface to the customers UPS. 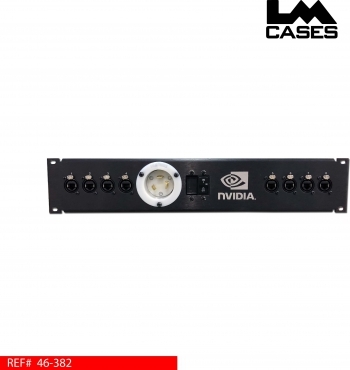 The panel also features 8 Neutrik Cat5 jacks to provide network signal to the rack. The panel allows the rack to be used with the front & rear doors closed. A 25ft 10awg cable with L6-30 connectors was built to provide the main input power. The panels are constructed out of .125” thick brushed aluminum that is black anodized, all labels are laser etched. 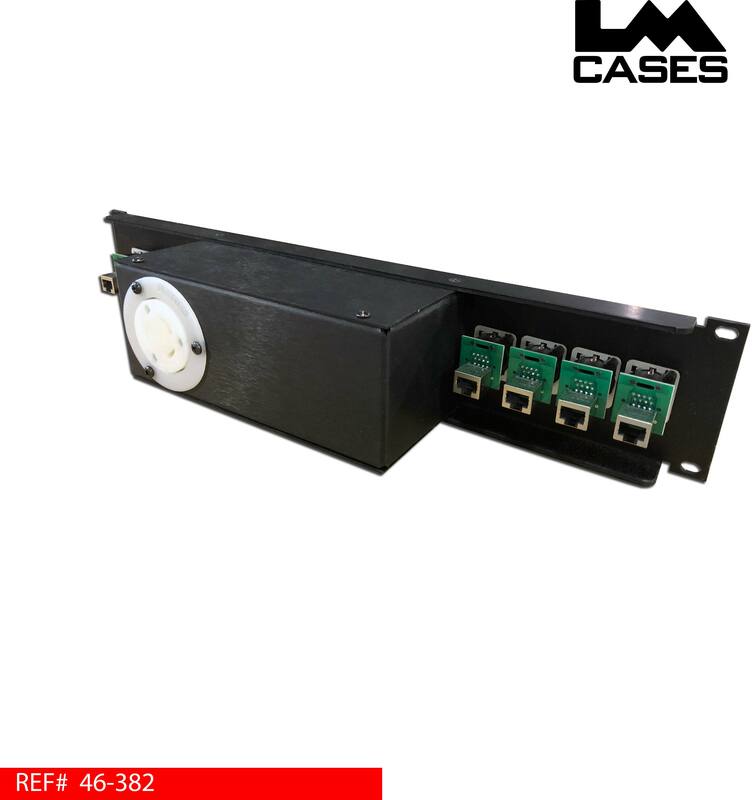 Because all the components run at 208v, a step down transformer was used to provide 120v current to the fans which were the only components that required 120v power. 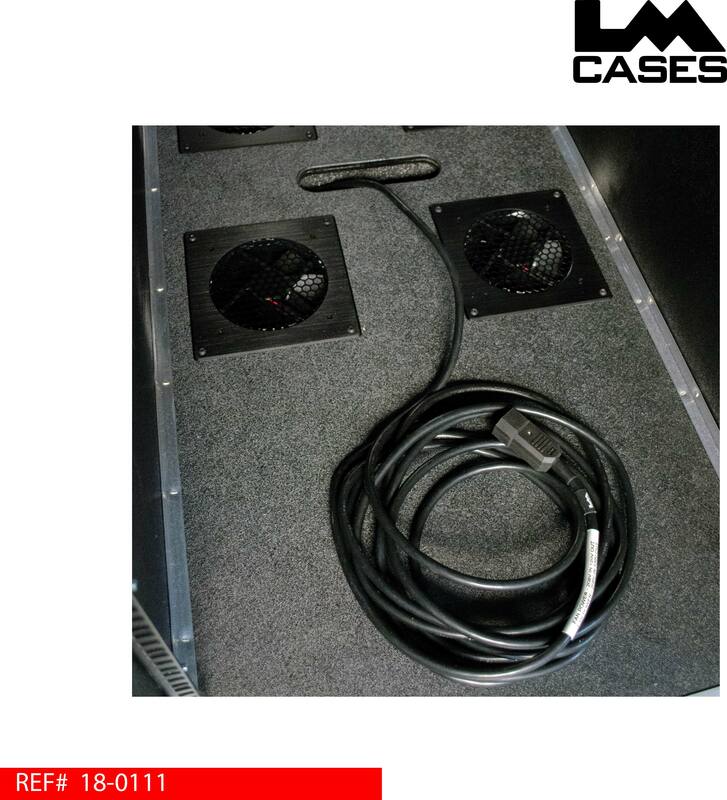 Power to the fans was provided by a custom cable fitted with a C14 connector which allowed easy integration with the customer’s 208v PDU. All cables are labeled at both ends with heat shrink text labels allowing for easy identification should there be a problem. All components were provided by and installed by the LM Cases Custom Integration department. CLICK HERE for additonal information on the power panel. The exterior case is built from 1/2” plywood laminated with black ABS plastic. Nvidia required the case to be as water resistant as possible. To accomplish this, LM sealed all the panel ends with caulking prior to fitting them into the aluminum corner stock and tongue and groove pieces. All hardware was sealed with caulking once installed into each panel. The lid tongue and groove is fitted with a neoprene gasket, valance spanning latches were used to allow a continuous tongue and groove fit around the lid perimeter. The exterior case also featured LM’s custom designed forklift guard. 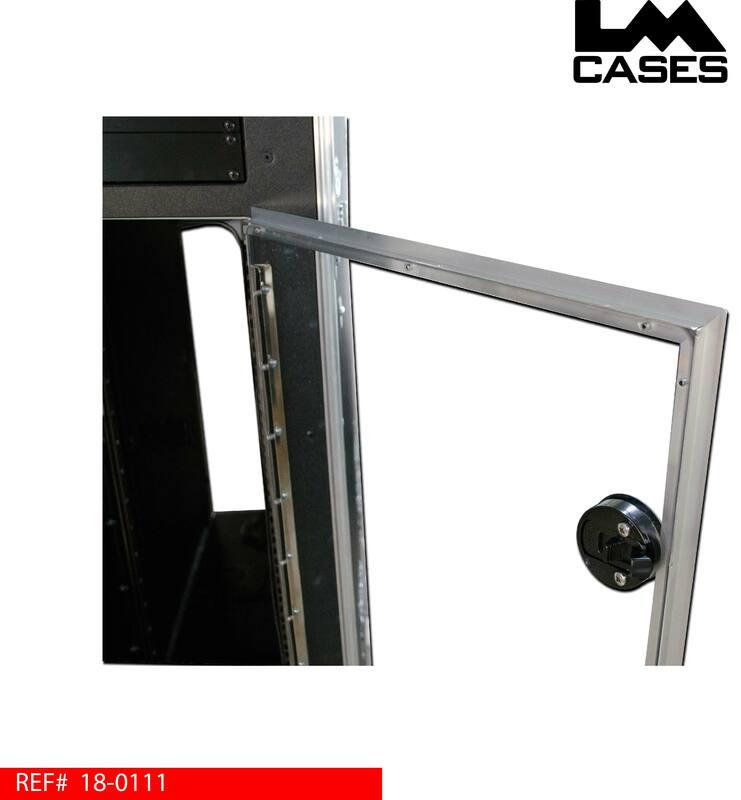 This guard is built from 1/4” aluminum that is extruded to fit our corner stock. 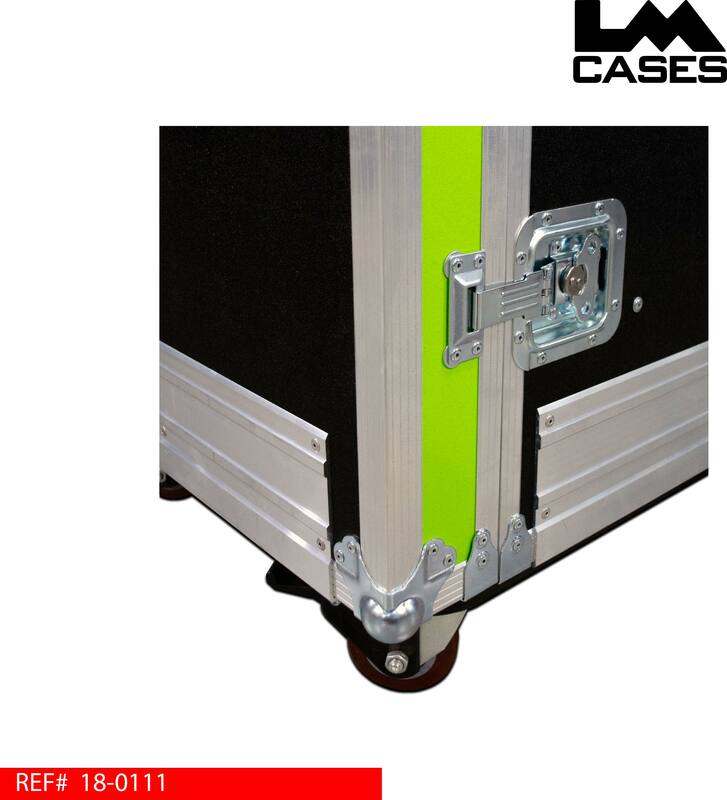 The guard prevents damage to the aluminum when forklifts push the case. 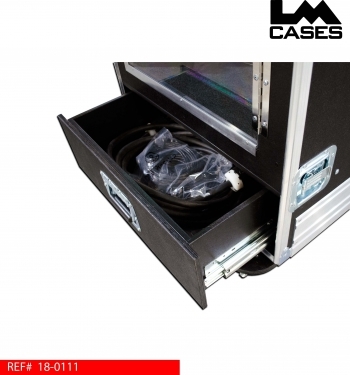 The case exterior features deep recessed handles and 4” x 2” Colson casters.